Johanna was professional from the outset; from the first call all the way through to the final delivery of our promotional video, she made the process easy. She made the journey enjoyable and was incredibly flexible meaning that I could fit the filming around our busy term. Once at our venue she made our students feel completely at ease allowing her to get some really lovely natural shots which just shine through in the video. I cannot recommend Johanna highly enough for anyone wanting a friendly, efficient, speedy and professional service. Thank you so much! It's amazing! You've made the house look absolutely stunning. We're so pleased with it. Thank you very much. The film you shot of our home was most impressive. Your attention to detail and creative style really captured the essence of our home. So much so that we went under offer within days of the film going live. Our buyer came to view the house as a direct result of watching your virtual tour. I am in no doubt that the videos have provided us with a significant edge over our competitors and have definitely aided sales. Firstly, I must congratulate her on the wonderful film that she created, I was extremely impressed. Secondly, I found the experience a very enjoyable one, Johanna took such great time and care with each and every shot, making sure that she had the best angle for each frame. 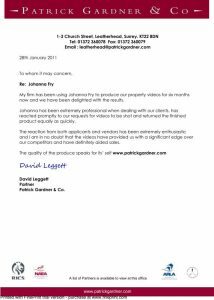 The video tours have been a total hit with sellers and buyers alike, have significantly raised our profile and have been a superb tool for helping to secure instructions. I am delighted to report that everyone at Christies is absolutely delighted with our New Video facility for our vendors. The whole process has proven to be very simple and seamless. 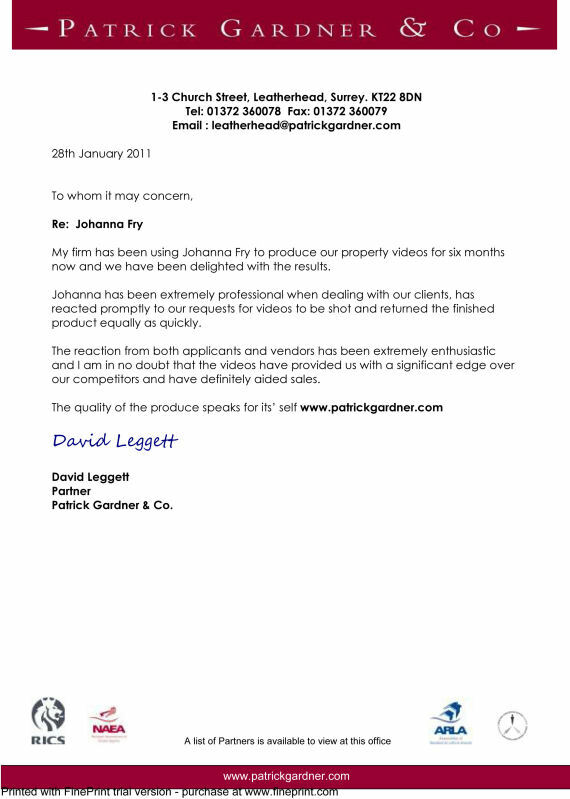 However, the very best thing coming out of all this is the wonderful feedback we are receiving from our satisfied clients. It is definitely helping us to win more instructions and secure better fees!! We are already beginning to experience higher viewing levels as a result of the appealing videos . You really are a magician with your video camera and the presentations are so professional. I am delighted to recommend you to anyone who wish to secure a Winning Edge over their competitors. Many thanks for all your excellent service. Just a note to say how delighted we were with the magnificent film that you produced to help to sell Maybury. The way in which you showed the house, bringing out all of its original and unique qualities, was truly amazing and demonstrated a great skill. I am sure that when prospective buyers saw the film, it would have encouraged them to view the property, because your film really did demonstrate the adage that “a picture is worth a thousand words” so well. Indeed, most of the many people that came to view the property on “Open Day” commented on the quality of the film and said that seeing the many unique features of the house on film had motivated them to book an appointment to view. Johanna has been working alongside our company now for over 5 years and our association has proved to be an excellent addition to the services we are able to offer to our Clients. Her reliability, quality of work, friendliness yet outstanding professionalism, showing a tremendous effort to every detail, has proved to be a great success resulting in a very positive reaction from all our Clients. I own an estate agency in the Surrey area and having worked with Johanna for the last few years I can highly recommend her and her company personally to anyone. She provides consistent professionalism, the quality of her work and attention to detail is exact every time, she offers reliability and entrepreneurial drive. The reaction from clients has given us not only a competitive advantage but has also helped us win awards in our working sector simply by championing her services and above all she is a pleasure to work with. I can't recommend her enough. Thank you for helping to capture and convey the essence of what we do and connecting with our valued supporters. Simple, fresh perspective, professional expertise, supportive and enthusiastic! It’s terrific having a partnership with Johanna. She has an instinctive understanding of what each house offers and how to bring this out to the greatest advantage for our cleints. I hate being photographed and I thought being filmed would be right out of my comfort zone. I was right, but Johanna made me feel at ease, by being calm and showing no frustration at all, even when I couldn't get the words right time & time again: she has infinite patience. Filming over two hours of footage and finding just the right shots amongst it all to create a short, focussed and concise visual message, is pure genius and perfect for my business. I loved her creativity: the ideas she had for the music and visual effects really brought the whole thing together. My film has had 1,400 views in a week on Facebook, so I couldn't be more pleased. Johanna created a wonderful video for our company. It was professional and very informative. The video captured exactly what our company does. When our executive teams across the globe viewed it, several wanted to localize the video for their region’s website. Johanna was professional and very easy to work with. She completed the project in a timely manner and was very price-competitive. Johanna really understood the brief we gave her and developed a unique video beyond our expectations. I would definitely recommend working with her!